Nawaz Sharif takes notice of the attack, demand­s immedi­ate report. 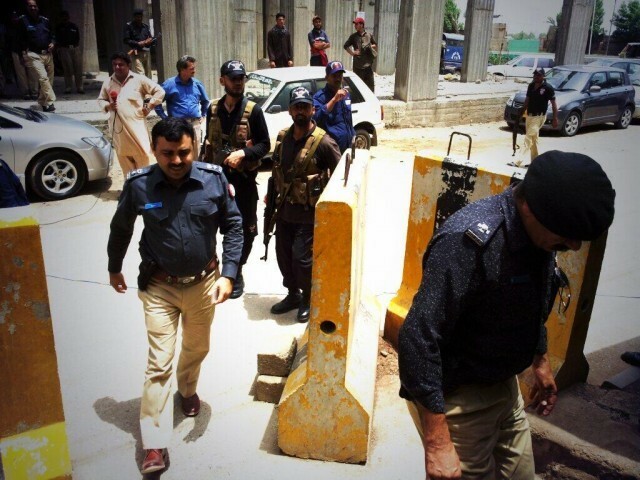 KARACHI: A woman and a guard were injured when four unknown armed persons on motorcycles opened fire at the Express Media office, Express News reported on Friday. The injured guard and woman were shifted to a nearby hospital for treatment. Despite being notified, police officials took 40 minutes to reach the site of the incident. It is estimated that they sprayed 20-22 bullets at the office building. Prime Minister Nawaz Sharif took notice of the incident and demanded immediate report on the attack at the Express Media office. He also said that he hoped for speedy recovery of the injured. President Asif Ali Zardari has also taken notice of and strongly condemned the attack on the Express Media office. The Chief Minister of Sindh, Qaim Ali Shah took notice of the incident. 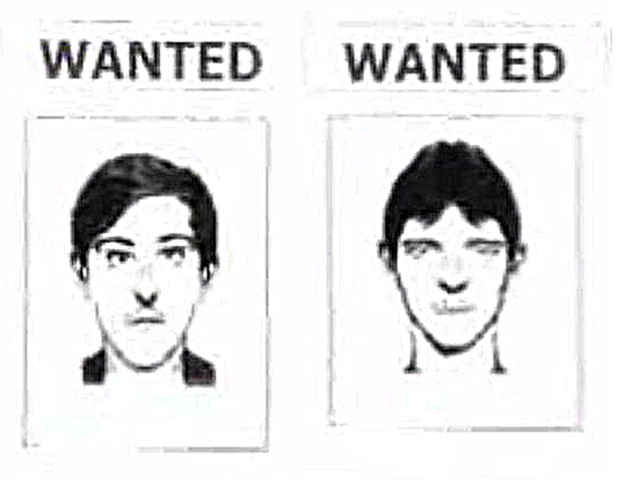 Sketches of two suspects believed to be involved in the attack have been released. As the clock struck midnight, youngsters took to the streets and started firing rounds of ammunition. Unanimously passes resolution against LoC firing, mob attacks on high commission, PIA offices, vilification in media. India Foreign Office spokesperson says Pakistan should also take action against Hafiz Saeed. Shocking news. But why?? Stay safe. What would be the safety of staff when moving in and out of the office i.e. home to office and office to home or field. what is the message ? keep off criticizing religion , Pakistan & TTP. The involvement of the same people who made Jasmin Manzoor flee the scene,cannot be ruled out here!come on its Democracy,Desi Style! Happy no one was killed ………….. but this is a warning ………….. from? Et this is a sign that you are doing something right………..well done. Two motorbikes arrive, two men get off and fire. Seems like enough time for one of the several guards placed outside to at least return fire..
Come and shoot us, shut our businesses but we will not stop telling TRUTH….journalist are ment to die for truth and we are ready……. What about your security staff, what were they doing? Your office should work on your own security arrangements. The most vibrant and fearless daily in Pakistan has been attacked. Reason for this attack must have been conveyed to ET which should be disclosed to the viewers. Stay safe and God less you all. we will not stop telling TRUTH….journalist are ment to die for truth and we are ready……. How do these people get guns. Is it that easy in Pakistan to get the guns? @Naeem.Asghar: Oh come on sayeen do not be so emotional like Sikander who was arrested in Islamabad last evening…anyway stay safe! 4 Motorcyclists, 2 on each bike, all wearing helmets, the rear ones unseated and fired, then they fled. The most common, popular, cheapest & easiest mode of attacking in Karachi for many years. No govt., agency, police etc. ever formulates any mechanism, law, networking, monitoring & surveillance system to track, grab & punish these ‘biker killers’. From where they come, where they run, where they hide, where they park their vehicles, and next day how they come on roads again with same bikes and guise? CCTV control rooms skip them always and report nothing. I think every native is having some fair idea about such heinous activists living in their areas- few of the journalists know the names even of such terrorists (backed by Political Parties) then how come not the Police or Security Agencies or Sind Govt know about them? Wait..wait wait – They already know them? They do have the tracking system? I see…then -The Same Reconciliation Politics, The Promises of Same Future Coalitions, The Same Hidden Support to Killers & The Same Weak Prosecution if Caught, And at last- Helpless and Scared Courtrooms releasing them with Honor are the Reasons & Consequences for encouraging these killers to act persistently. The victim is the common innocent citizen. Disappointing as always- Shame on Police, Agencies and Sind Govt for being sold out so cheaply. Must mean your doing something right – keep up the good work. ….,, And please, does anyone know the exact number of Rangers deployed in Karachi? Each of them should be equipped with a DUFF so that they can play them to keep themselves little busy when innocent citizens are being attacked, injured and killed freely over here- REAL BURDEN on the Economy and a team of ILLUSIONISTS to deceive Karachi being Secured & Monitored. Consistently ineffective & failed by results, but still here for just SILENT SIGHTING. How ,openly they fired, no security people here? They just came to take measurements!! I think, as most of the times the case is, it MQM trying to pressurise Channels. People are giving various reasons, motives for the attack. Let me add my one cent towards that. By the way, did ET hire new security agency lately and fired the old one ? If yes, I won’t rule out the mischief by the earlier security agency. In mqm bashing how conveniently we are ignoring innocent friends of NAYA KPK for whom Karachi is the largest base camp. ET’s sponsors belong to the community which has most recently joined the club of victims. It’s shocking for me. I just read the news. May Al-Mighty Allah save every one at the Express Media Office. oh my goodness, sorry about this incident. I hope everyone remains safe and non violent please. Please refrain from commenting. It’s our internal matters. In fact it’s your anti-Pakistani rants allowed in ET made itself a target. So if you love ET, lie low for a while, come back when things cool down a bit. We don’t want ET to be harmed in anyways.